Welcome inter-modal adventurers! to BikesandTransit.com‘s local travel blog Bikes and Transit Travel. Over the summers of 2011 and 2012, I’ll be mapping six (6) more routes for the website, and blogging here about those rides. These new routes will showcase a perfect variety of local inter-modal tourism opportunities – from simple, to not so simple, for families and veteran cyclists alike – and they’ll reflect well the 20+ local daytrips mapped and profiled on BikesandTransit.com. The first blog (1) is about biking in Oshawa via GO train and bus. Next, the Welland Canal via Coach Canada highway coach (2), then Hamilton – South (3) by HSR city bus and GO train home, and Hamilton – North (4) by GO bus and train. In 2012, look for reports on inter-modal daytrips to Burlington’s Royal Botanical Gardens (5) and (6) the bike ride from Port Colborne to Fort Erie, to Niagara Falls. Since the launch of the 2008 pilot GO-by-Bike to Ajax! thousands of local and visiting cyclists have enjoyed learning about and riding our local trails – and appreciating the bikes and transit that got them there! Come on and give it a try – if you start now, and do one, two, three each cycling season, you’ve got years of amazing and physically rewarding outdoor adventures ahead! 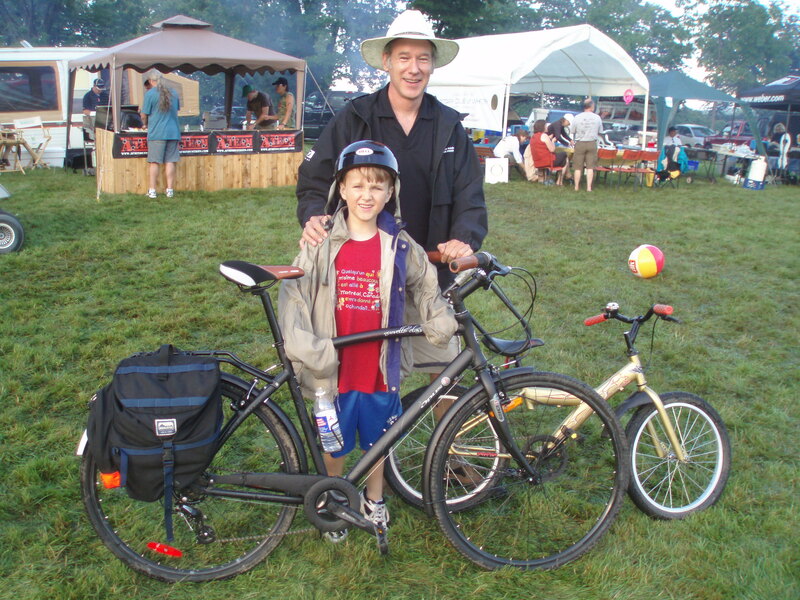 The photo above was taken at the 2009 Whitby Rib Fest, some 60 kilometres from home. My seven year old and I got there by GO train and bike. To and from the train to the Fest totaled just 15 kilometres. It rained a tonne too – but really it was a great, memorable day. With BikesandTransit.com and now Bikes and Transit Travel, my aim is to encourage and facilitate a new kind of tourism, by sharing the ease and rewards of combining cycling and transit for travel in and around Ontario’s Golden Horseshoe. Not to mention reasonable transit fares (where bikes ride for free! – except during rush hour!). In Toronto for example, a bikes and transit daytrip starts at $3.00 for the TTC subway ($6.00 return, or $10.50 for an all day family pass for six). $15 to $20 return can get you cycling the wilds of Durham and Burlington. For $20 – $30 – $40 you’re exploring the special beauty of Hamilton, or discovering just how close (and flat!) Niagara really is! So here we go… Ajax, Oshawa, Hamilton, Port Colborne await!… by train, bus, subway, highway coach, ferry… and bike! I hope by reading my local, lightweight, inter-modal travel posts, more cyclists will do the same! You are currently reading Six upsides to staying local, traveling light and going inter-modal at bikes and transit travel.